When Gotham West Market opened a few months ago, I knew I had to get there soon. It has a lot of what I love about New York: great food and chefs, cool but under the radar location. It's been referred to as a "food court" and with that, I picture Auntie Anne's soft pretzels, Chick-Fil-A, and the general scent of fried food in the air. This is no food court - it's a smorgasbord of incredible, many New York-centric, vendors, eight to be exact. The Brooklyn KitchenYou'll want to browse at The Brooklyn Kitchen, an offshoot of their original store in Williamsburg. There are tons of made-in-Brooklyn items from pickles and peanut butter to salmon and cheese, but just tons of great products and a fun slate of cooking classes. Inside Brooklyn KitchenCourt Street Grocers, another Brooklyn implant, serves sandwiches. El Comado is fabulous for tapas from Chef Seamus Mullen, who does incredible tapas at one of my favorites, Tertulia in the West Village. And foodies are trekking here specifically for ramen from Ivan Ramen, his first opening in the U.S. (there are two in Japan). It's an easy walk from Times Square on the far west side of Manhattan, technically in Hell's Kitchen. If you only have a limited time in New York, I'd skip it. But if you're on a return trip or interested in seeing what's new in NYC, it's definitely worth it! I have been shopping for baby and toddler gifts at Dinosaur Hill, a magical toy shop, ever since we moved to NYC and I stumbled upon it in the East Village. I am not a parent yet and they make it so easy to find the best, age-appropriate gifts! I love the range of classic gifts that I know from when I was little to newer items that any kid would love. It is a really special place and has been open since 1983, an eternity in this increasingly homogenous city. The Little Owl is still perfect! I've gone for brunch, lunch, and dinner (including my birthday dinner last year) over and over again - and it remains one of my top five favorites in all of New York. One of my brothers is here for six weeks from L.A. for work, and we met there today. It. Is. Perfect. Tiny, cozy, homey, delicious, friendly, and one of the best corners in the city. Share the signature dish - meatball sliders on garlic buns - three to an order. It's one of the greatest bites you can have in the city. You can only get the whole wheat pancakes at brunch and they melt in your mouth as opposed to your normal doughy, heavy pancake. Then wander the West Village - over to the Hudson River, on Bleecker, Hudson, and Christopher Streets - a Sunday that's hard to beat! Minetta TavernMerry Christmas everyone! Are you snuggled up in pajamas on your couch? I hope so! I just got back from an incredible trip to Laos & Cambodia but I got sick at the very end of the trip. Picture massive Exorcist-style sickness (or actually, don't picture it) at a beautiful restaurant in Siem Riep in front of multiple diners and friends. Then I got awful chills and a 103 degree fever on my flight from Hong Kong to JFK and the worst jet lag to ever hit a human being when I got back. Basically, it was a terrible ending to a wonderful, adventurous, life-altering trip. It took me days to come out of that fog and I've been a giant sloth since I returned. Which brings us to Christmas day - can we talk about how awesomely terrible Hallmark Christmas movies are? I've basically had them on rotation. Candace Cameron Bure (Full House!) plays the same character who hates Christmas as an uptight career woman but then is shown the magic of the holiday through a handsome man and a failing business, usually a resort. Neil Patrick Harris played an especially terrible role as a dejected doctor in "The Christmas Blessing." Our roast turkey, two kinds of stuffing, sweet potatoes, brussels sprouts & pancetta, homemade gravy & cranberry sauce are filling our place with the most mouthwatering smells. But there is other food on my brain. You have to go to Minetta Tavern. I had been to this still super hot spot in Greenwich Village before, but for some reason I didn't order the Black Label Burger. I was an idiot. You have to get this burger. It's been written about thousands of times and for good reason. It's $29 but when a burger is this good, you'd gladly pay triple that. Plus, perfect French fries on the side. If you can't get a dinner reservation, try brunch, which is what I do. Black Label BurgerAfter I was so sick, I ate the entire plate of food and didn't care because I was so happy I was hungry again. And the inside is just so super cozy and perfect for New York City's wintry mix days. 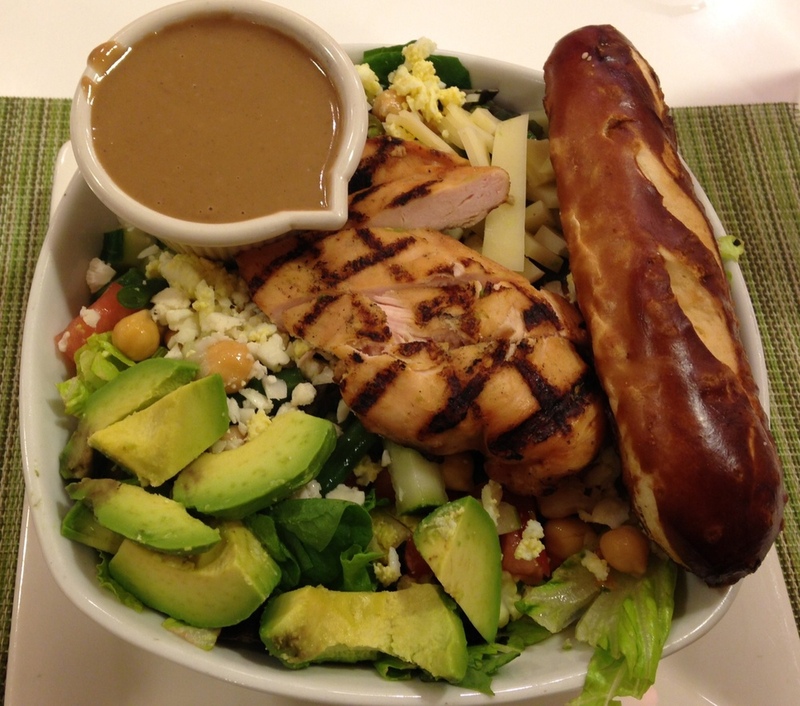 There aren't many good salads here in New York City. When I go to L.A., I can find a perfect, CHOPPED mix of greens/fruit/nuts/cheese/whatever I want salad almost anywhere. I am dreaming of the Beverly Hills Hotel's Polo Lounge McCarthy Salad in particular. And my favorite Chinese Chicken Salad from Joan's on Third, which probably has as many calories as a double cheeseburger but I don't care. The other day, I had a lunch meeting cancel in Midtown so I took myself out to lunch at 40 Carrots on the 7th floor of Bloomingdale's. Bloomingdale's is where I would shop all day long if I could, and now every time I go, I'll eat at 40 Carrots. They're known for their frozen yogurt but the ambiance reminded me of being in Southern California - bright and cheery. And you know what? Their chopped salad was pretty damn good. Just in case you were feeling virtuous for ordering a salad, they give you a giant (mediocre) pretzel roll on the side and a gravy boat of salad dressing. The best part is adding small (extra-large anywhere else) frozen yogurt. Try tart mixed with peanut butter. Yum.